Web-Sync service is an annual fee. We will host your team/league information on our servers giving you a turnkey website that automates the collection, aggregation, and updating of season and career statistics with no extra effort. Just use DakStats for each game and its built in tools to upload statistics to the Web-Sync server. Updates season and career statistics automatically. Updates Conference, Region, Division leaders automatically for both Team and Player stat categories. The DakStats Basketball Web-Sync is intended for a league or conference that uses the DakStats Web-sync to collect league stats. 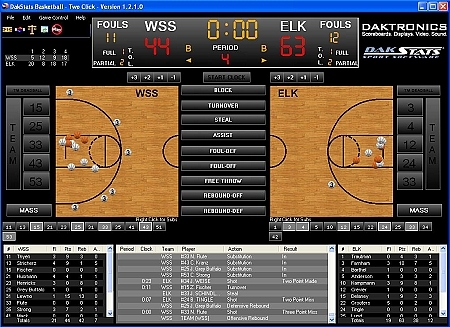 All the features of DakStats Basketball Full are included in this annual license. Pricing varies depending on the size of the league so please use the proper discount code when ordering to ensure that you receive the proper discount for your league. We're here to help! If you're not sure which DakStats package if right for you, please contact us at DakStats@Daktronics.com BEFORE purchasing a package. Please remember that DakStats Sport Software is non-returnable.